The concept of ‘Neighbourhood Plans’ was introduced under the Localism Act 2011 and they are fundamentally about giving rights to local communities about the type, location, size, pace and design of developments in their area. · Include policies such as on design standards, which could take precedence over existing policies in the Bromsgrove District Council Local Plan for the neighbourhood. · Housing developments, including affordable homes, and bringing vacant and derelict housing back into use. · Provision for business to set up and expand their business. · Issues around roads, cycling, walking and disabled access. · Development of schools, places of worship, health, leisure and entertainment facilities, community and youth centres and village halls. · Protection and creation of open space, nature reserves, allotments, sports pitches, play area, parks and garden, and tree planting. · Protection of important buildings and historic assets. · Promotion of renewable energy projects. A formally adapted Neighbourhood Plan will be part of the statutory development for the area. 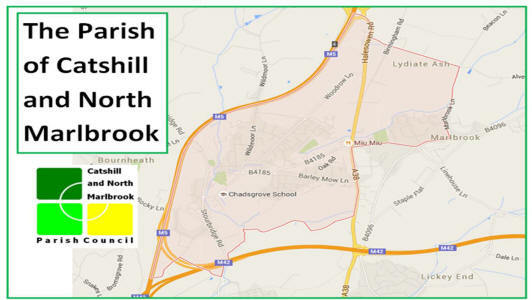 There is a legal requirement for Bromsgrove District Council to take into account the contents of local Neighbourhood Plans when making future decisions on planning for those areas. Catshill and North Marlbrook Parish Boundary.